In recent years, there has been a rise in awareness and understanding of Prenatal exercises. The widespread acceptance of prenatal yoga among pregnant women in India has helped them avail the multiple benefits of exercises during pregnancy. “I started attending the prenatal classes during my 5th month of pregnancy and they have been tremendously helpful. Dr Anuradha has been exceptionally brilliant in conducting all the prenatal exercise and education sessions, clearing all my doubts, anxieties and helping me out through the pregnancy stress, pain and difficult situations in this phase,” says Mrs Jasleen Parmar. She is one of the many pregnant women who have benefitted from prenatal exercises program at ReLiva. ReLiva propagates prenatal fitness among expecting mothers with its dedicated FabMoms Prenatal care program. This program can be taken at select ReLiva centers in Mumbai, Thane, Navi Mumbai and Pune. Several research findings also corroborate these benefits with respect to helping back pain1, gestational diabetes2 and overall physical health3 among expecting women. 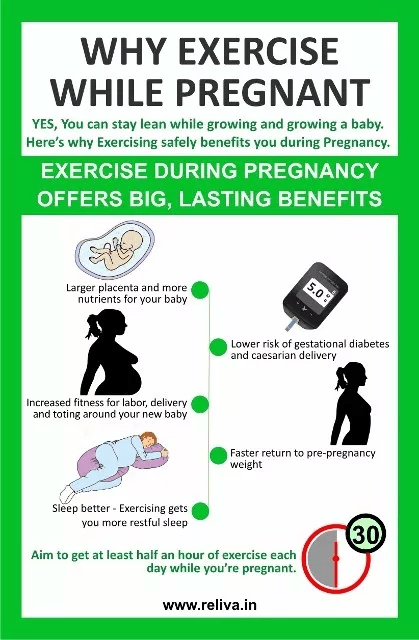 You can read more about benefits of exercising during pregnancy at this link. Yes, it is safe to exercise during pregnancy, as long as is it is done under supervision and guidance of a qualified prenatal expert or physiotherapist. When should exercises be avoided during pregnancy? Your gynaecologist or a prenatal expert like that at ReLiva will help you understand if you qualify for prenatal exercises. You should not exercise during pregnancy if you have any of the following conditions. When can I start exercising when pregnant? Pregnancy is usually discovered by 5th week and sonographically confirmed by 8th week. However 13-14 weeks is when pregnancy is usually known to get well established. Prenatal experts from FabMoms, leading prenatal and postnatal service recommend a pregnant woman can usually start exercising after this time ie from 15th week of conception, unless your supervising doctor has specifically directed you not to. At Reliva, you will have a thorough clinical evaluation before commencing a prenatal exercise program (as per the prenatal guidelines from ACOG - American College of Obstetricians & Gynecologist) to ensure that you do not have medical reasons to avoid exercise. What exercises are best when pregnant? Most often cardio exercise are considered safe during pregnancy. A good prenatal exercise program will include a mix of cardio exercises along with practices to strengthen your pelvic floor muscles. It will also train you to adopt proper posture for pregnancy, which in turn will help to avoid pregnancy related aches and pain. How long can I do prenatal yoga? Your prenatal trainer is equipped to guide you to a set of practices that suit your changing pregnant body. Women who have exercised regularly through their pregnancy months under supervision have been known to remain active until they got into labor as exercises further helped them to stay supple and strong for child-birth. However, in case of any doubt exercises and physical activity should be immediately stopped and advise taken from a qualified medical practitioner. When to discontinue exercises while pregnant? How much exercise is ok when pregnant? A good rule of thumb is to stop before you begin to feel tired or breathless. Fatigue should not be allowed to set in at any stage of exercising during pregnancy. Pregnant women who were sedentary before pregnancy should follow a more gradual progression of exercise. Although an upper level of safe exercise intensity has not been established by ACOG or RCOG, women who were regular exercisers before pregnancy and who have uncomplicated, healthy pregnancies should be able to engage in high-intensity exercise programs, such as jogging and aerobics, with no adverse effects. A qualified prenatal exercise trainer will conduct an assessment and evaluation to give exercise advice specific to your pregnancy. Does prenatal exercise really help with labor? Prenatal exercises that are focused on strengthening muscle groups that support the growing uterus and prepare the body to deal with the stress expected during natural child-birth. Bearing down exercises that work around muscles which are used during child birth and support eventual passage of the baby through the birth canal. Knowing what to expect is half the battle won. It is the fear of the unknown that wears down most expecting women and may eventually interfere in what may otherwise be a complication-free child-birth. A proper understanding of the process of child-birth and understanding of different stages leading to delivery goes a long way to keep the mother comfortable when the actual time comes. Pain is an essential part of the birthing process and is usually the sign of the start of the process of your baby’s birth. A timely practice of breathing practices helps the mother in labor to deal with this pain and stay as calm as possible, preserving as much energy for the actual child-birth. You can join supervised Pregnancy exercises with FabMoms. Click here to know more. Or enquire with us at +91 9920991584 and we will connect you with a prenatal trainer near you. 1. Pennick V, Liddle SD. Interventions for preventing and treating pelvic and back pain in pregnancy. Cochrane Database Syst Rev 2013(CD0011):1-100. 2. Sanabria‐Martínez G et al. Effectiveness of physical activity interventions on preventing gestational diabetes mellitus and excessive maternal weight gain: a meta‐analysis. BJOG 2015;122(9):1167-74. 3. Price BB et al. Exercise in pregnancy: effect on fitness and obstetric outcomes-a randomized trial. Med Sci Sports Exerc 2012;44(12):2263-9. This article is based on contributions from Dr Trupti B. (PT) and Dr Anuradha M (PT). Dr Trupti is a Masters in Cardio respiratory Physiotherapy and Dr Anuradha is a Certified Child birth Educator (USA). They successfully attend to women clients for pregnancy and related care at ReLiva clinics. Confused about exercise as low back pain treatment? Here are the answers about exercises for back pain relief. Summer break not Obesity break. Here are 7 fun ways to keep your kids active during this summer vacation. All of these ideas are designed to encourage children towards physical activity, exercise and stay healthy. And summer is tons of fun.